I always thought that no teeth mean no brushing at least where newborn babies were concerned. Hence I was in a massive shock when I found my confinement nanny (jaapewali bai) cleaning the mouth of my barely 2-days old daughter with a wash cloth dipped in honey. “Why?” I asked absolutely shocked. “Honey cleans the mouth,” she replied confidently. “No honey for my daughter,” I instructed her very clearly. Her pediatrician had strictly advised us not to give honey to the baby till she turned 1 year old due to chances of infant botulism. But I realized I needed to find out if a baby’s mouth needed to be cleaned and how. Well, the Internet is a mine of information and that’s where I went. I learnt that tooth decay is found in 20% of children between ages four and five and nearly 86% of children have some sort of tooth decay by age 17. I learnt that a simple wash cloth dipped in water was enough to clean your newborn’s mouth. Wet one end of the cloth and move it around your baby’s cloth and it’s clean. But when she turned 6 months and started solids, I was somehow not satisfied with the wash cloth alone. Her gums were developing and her teeth were sprouting. So I bought a finger brush. It’s a plastic thing that you wear on one of your fingers. It has soft bristles on one end and a gum stimulator on the other. I found it very convenient to clean my baby’s mouth till one day my daughter decided to bite my finger, very very hard. I realised that time had come for another upgrade. Off I ran to the market and bought a brand new tooth brush. It was Chicco’s and it cost me Rs. 200. I paid a bomb for the tooth brush only to discover at the month end that all its bristles were worn down and hence not fit for use. Since then, I buy only Colgate or Nuby. Now the brushing part. When my daughter was little, it was easy to brush her teeth. Up and down, and all around. And it was over. But as she started growing up, it wasn’t that easy. One day she didn’t want to brush and the other day she wanted to brush only by herself. I introduced tooth paste for her (ask your doctor for recommending or any good tooth paste will do that contains fluoride), just a tiny wee bit. Then came the pea-sized portion. And now my little darling loves the taste of the tooth paste so much that it seems she brushes her teeth only to eat the paste. ‘Give me more, more, more,” she shouts when she realises I have cheated her. She needs to brush twice daily or else tiny insects will make holes in her teeth. And then the dentist uncle will need to pull out her teeth which is a painful process. Also, she should spit foam (and not ingest) or else the same tiny insects will find their way into her tummy and hurt her. It took time but we got there. I brush her teeth after she drinks milk. I usually brush her teeth in the morning only after she has drunk her milk. I always keep two tooth brushes; pink and yellow, one for morning and the other one for evening brushing. Nowadays, tooth brushes come with different animated characters too. It makes brushing for kids more exciting. I deliberately brush my teeth when she is around so that she knows that her mother takes brushing the teeth seriously herself. I have an app called Talking Tom or Talking Ginger installed on my smartphone. I show my daughter how the animated cat brushes her teeth. It really helps. Throw away the toothbrush in a month’s time. Believe me, at the end of a month, you won’t even feel like looking at the poor toothbrush. Kids are incapable of brushing their teeth properly till they turn 7. So always brush their teeth. First I let my daughter brush. It’s more of a play than actual brushing. So later, I brush her teeth and clean her tongue. Once your child turns 6-7, you can switch over to adult toothpaste. Get your child’s teeth examined by a dentist every 6 to 12 months. 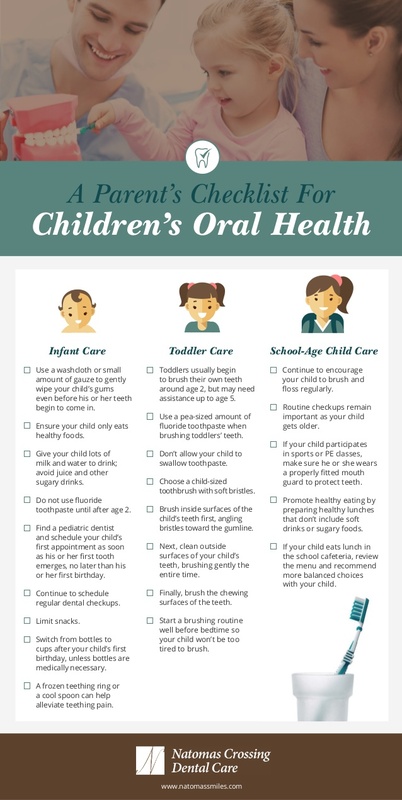 Here is a children’s oral health care checklist for parents thanks to http://www.natomassmiles.com/. How do you manage to keep your child’s teeth sparkling clean?